The ACH580 Hardware manual contains: safety instructions, a quick installation and commissioning flowchart, operation principle and hardware description, mechanical installation, electrical installation, installation checklist, maintenance and hardware diagnostics, technical data, dimension drawings, resistor braking, safe torque off function and optional I/O extension modules. You can download the ABB ACH580 Hardware Manual by clicking here. Recommended maintenance intervals and component replacements are based on specified operational and environmental conditions. ABB recommends annual drive inspections to ensure the highest reliability and optimum performance of your investment. 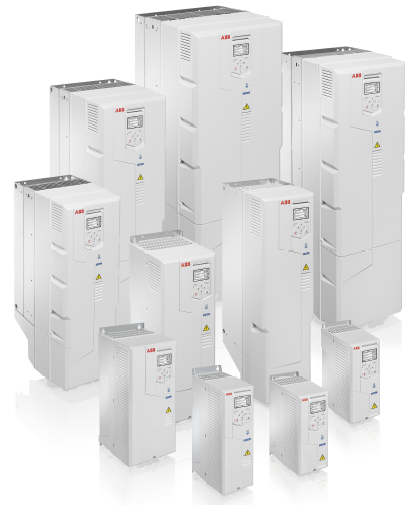 You can download the ABB ACH580 Maintenance Schedule by clicking here. This manual is intended for people who use an ACX-AP-x Assistant control panel. This manual contains information on: installation and start-up, control panel overview, basic operation, functions in the main menu, functions in the options menu, control of multiple drives, fault tracing, service and maintenance, panel-to-PC USB connection and technical data. You can download the ABB ACH580 ACX-AP-x Assistant Control Panel Manual by clicking here. Simplified climate control. ABB are not only committed to simplifying your interaction with the drive, but your entire HVAC system. The ACH580’s built-in features reduce on-site commissioning time, bring added value to existing control products and provide accessible diagnostics and troubleshooting. Read more about the ACH580 inverter by downloading the flyer here. You can download the ACH580 EU Declaration of Conformity by clicking here. In this Start-up and maintenance PC tool Drive composer manual you will find information on: overview of Drive composer, installation and uninstallation of Drive composer, connections, main user interface components, parameter window, monitor window, workspace handling, event logger, diagnostics, control diagrams (pro), FSO configuration and other functions that are common to many views, windows and functions that are not associated with any view or window. To download the ACH580 Drive Composer User Manual simply click here. In this catalogue you will find further information on the following topics: comprehensive climate control, handling the air side, controlling the water flow, the next evolution in climate control, motor control and energy efficiency guaranteed, any motor in any HVAC application, powerful and native communications, service as comprehensive as your drives and All-compatible drives portfolio. You can download the full ACH580 Catalogue by clicking here. The ABB ACH580 Firmware Manual contains information on: start-up, control with I/O and ID run, control panel, default configuration, program features, parameters, additional parameter data, fieldbus control through the embedded fieldbus interface (EFB), fieldbus control through a fieldbus adapter, fault tracing and control chain diagrams. To download this ACH580 firmware manual click here. This guide briefly describes how to install the ACH580 drive.To download the guide click here. The next evolution of climate control sets new standards both in simplicity and reliability. Download the ACH580 Techinical Data Sheet by clicking here.